Soap fans love it when late night comics rib suds stars on shows like The Soup, or shoot fish out of cannons at them on Last Week Tonight. With the recent appointment of The Bold and the Beautiful producer Colleen Bell as U.S. 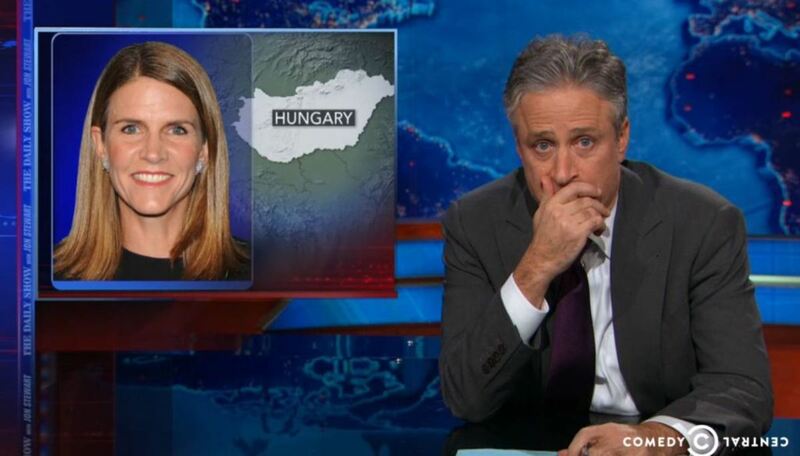 Ambassador to Hungary, the cable comedians are having a field day. "She can help us when Hungary&apos;s prime minister Viktor Orbán&apos;s wife wakes up from a seven year coma, just in time to call off her daughter&apos;s wedding to a man with amnesia, who turns out to be a woman who&apos;s pregnant with the illegitimate son of the prime minister&apos;s evil twin Fernando. All this on tomorrow&apos;s All My Hungarian." Okay, that sounds more like General Hospital than B&B! Watch the segment from The Daily Show below. Is Brad Bell's Wife, Colleen About to Become a U.S. Ambassador?